Home Destinations Adventures by Disney New Disney Parks Experiences Announced at the D23 Expo Japan! Last summer, we announced plans for an immersive Star Wars-inspired resort to be built at Walt Disney World® Resort. Tonight we’re happy to share more details on what this thrilling new resort, which will be seamlessly connected to Star Wars: Galaxy’s Edge at Disney’s Hollywood Studios®, will be like. This first-of-its-kind resort will combine luxury with complete immersion into an authentic Star Warsstory. Guests’ journey through space will start when everyone departs together for a multiday Stars Wars adventure by boarding a starship alive with characters and stories that unfold all around them during a voyage through the galaxy. Stay tuned for future updates on this fascinating place! Pixar Pier will open June 23, 2018 at Disney California Adventure® Park. This reimagined land will feature four whimsical neighborhoods representing beloved Pixar stories with newly themed attractions, foods and merchandise. 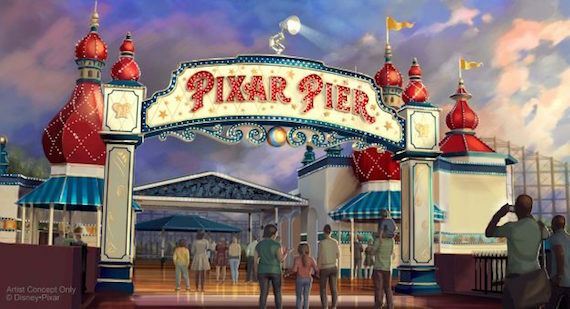 Guests will enter Pixar Pier through a new marquee, pictured above, which will be topped by the iconic Pixar lamp later in the year. The June 23 opening of Pixar Pier will also include the Incredicoaster – a super combination of character figures, lighting and special effects that will bring the Parr family racing alongside you in a high-speed adventure.Also coming in June is a dazzling new float for the popular “Paint the Night” parade featuring Mr. 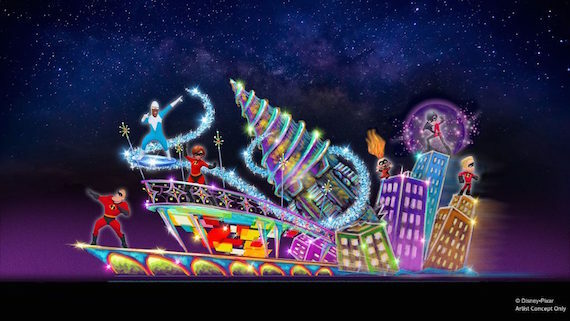 Incredible, Elastigirl and Frozone from “The Incredibles.” This new float will bring all of the fun and excitement of the Incredibles’ world to life with high-tech, pop-art effects inspired by the mid-century-modern style of the films. Dynamic and innovative visual technology will also bring Violet, Dash and Jack-Jack to life, showcasing their powers in surprising ways! “Paint the Night” Parade makes its Disney California Adventure Park debut when the first-ever Pixar Fest celebration begins throughout the Disneyland Resort on April 13, 2018. New Pixar-inspired experiences are set for multiple parks as Walt Disney World® Resort readies its “Incredible Summer” celebration. At Magic Kingdom® Park, Guests can visit Tomorrowland to party with characters from “The Incredibles” – including for the first time, fashionista Edna Mode. Over at Disney’s Animal Kingdom® Theme Park – just in time for the park’s 20th anniversary – a new show inspired by “Up” will star Senior Wilderness Explorer Russell and his furry-friend Dug.Toy Story Land is also set to open at Disney’s Hollywood Studios this summer. When it opens, Guests visiting this new land will “shrink” to the size of a toy and join in on the fun Woody, Jessie, Buzz, and Andy’s other beloved toys are having in Andy’s backyard. Here, guests can take a ride on the Slinky Dog Dash family coaster, take a spin on Alien Swirling Saucers, or visit a playful guest-favorite – Toy Story Mania! And just a reminder – we previously shared plans for an attraction coming to the France Pavilion in Epcot’s World Showcase inspired by “Ratatouille.” This attraction will be patterned after the experience in Disneyland Paris. In it, guests will shrink down to the size of Remy and join him on a crazy race through Gusteau’s kitchen and restaurant. Ratatouille is already the number one-family attraction at Disneyland Paris and will be a great addition to Epcot. Our first Mickey-themed ride-through attraction, Mickey & Minnie’s Runaway Railway at Disney’s Hollywood Studios®, is opening in 2019 – and we have new, exciting details to share! On the attraction, the fun begins when Guests see the premiere of a new cartoon short with Mickey and Minnie getting ready for a picnic. As they head out, they drive alongside a train and find out that the engineer is Goofy. Then, one magical moment lets your Clients step into the movie and on Goofy’s train for a wacky, wild ride. 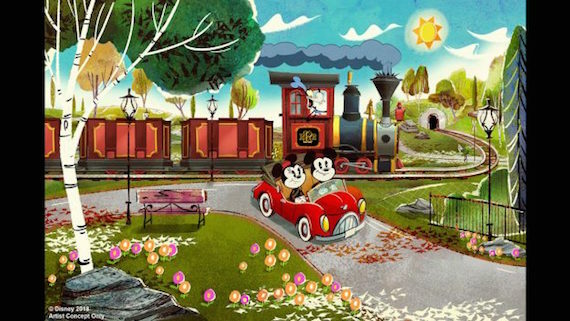 Mickey & Minnie’s Runaway Railway will put your Clients inside the wacky and unpredictable world of a Mickey Mouse Cartoon Short where they’re the star and anything can happen. And for the first time, we shared a preview of what the cars will look like when Guests board the attraction for a zany, out-of-control adventure filled with surprising twists and turns. 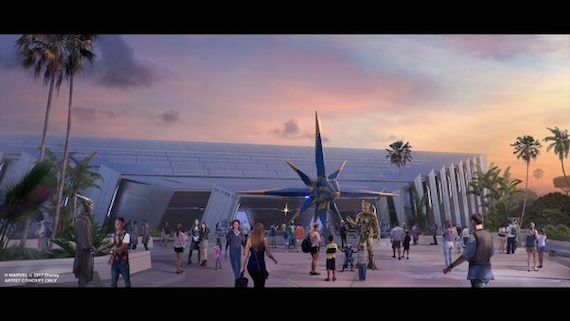 At D23 Expo Japan, we shared a first look at Epcot’s highly-anticipated “Guardians of the Galaxy”-themed attraction –and yes, it’s a roller coaster! With the “Guardians of the Galaxy”-inspired coaster, we’re going big. This one-of-a-kind family attraction will be one of the world’s longest enclosed roller coasters when it’s added to Future World at Epcot®. It’ll feature a unique story currently being created by Walt Disney Imagineering and include a new innovative ride system that’s guaranteed to “wow” Guests. Finally, a new Adventures By Disney itinerary was announced – Japan! A new Japan vacation is coming in 2019! The trip will offer immersive, cultural experiences, such as visiting temples in Kyoto, learning sword techniques with a master samurai, exploring the bustling city of Tokyo and more. The Adventures by Disney Japan vacation will open for booking later this Spring, so look for more details on this trip in just a few months. 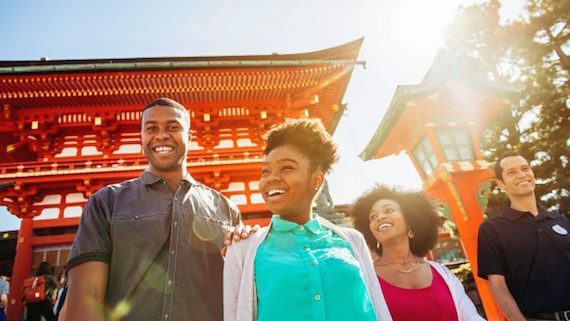 In the meantime, save up that vacation time and plan for an unforgettable Adventures by Disney family vacation to Japan in 2019. As mentioned above, bookings for this new Japan itinerary will be available to book later this Spring. As soon as it’s available, we’ll be happy to provide quotes for you here at MEI & Mouse Fan Travel. Be sure to contact your agent and let them know you’re interested, or keep following us on social media for a reminder to request your free, no-obligation quote for this or any other Adventures By Disney vacation! Follow us on Facebook, Twitter, and Instagram for continued updates on all of these exciting plans – and @ us to share which update you are most looking forward to!